Red Hot Chili Peppers poster on the wall? Check. Drum set with dirty clothes stuffed in the bass drum? Check. Exposed carpet nail strip that you stepped on each time you entered the room? Check. Ouch! Welcome to my childhood friend’s brother’s room. It was here that I discovered golden axes, dolphins that echoed, and a faster than fast hedgehog. Of course, I am talking about the pinnacle of the 16-bit era, the SEGA Genesis. When not outside playing with G.I. Joes or swimming in the pool, my friend Greg and I would often sneak into his brother’s room and take turns playing Sonic the Hedgehog. I remember thinking that the game was incredibly fast. 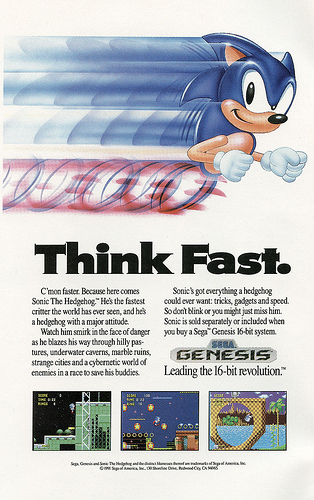 As advertised, Sonic was a lot faster than Nintendo’s Mario. SEGA. One of our most favorite games to play on the Genesis was Golden Axe. What is sad is that we were both terrible at it. I remember getting mad at each other for accidentally hitting the other person’s character. Whoops! I also recall typically playing as the muscled-out he-man. Greg would play as the dwarf with the long white beard. Sad to think that we never beat the game, especially after all the hours we sunk into it. My experience with SEGA systems goes even further back than Ryan’s aromatic room–dirty laundry mixed with deodorant–. 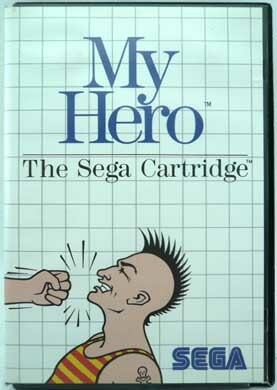 I remember my cousin Casey introducing me to the 8-bit SEGA Master System. I must have spent the afternoon with her playing Alex Kidd. She had all the cool toys, even Mario Paint on the NES. Beyond Casey, my friend Andrea also had a Master System– what is it with girls having all this video game goodness?–. I don’t remember what games I played over at Andrea’s house, but I do remember the distinct packaging of the Master System games. Beating Vectorman while hyped up on Vicodin. Hours of playing Road Rash. Feeling of claustrophobia from playing Echo the Dolphin.